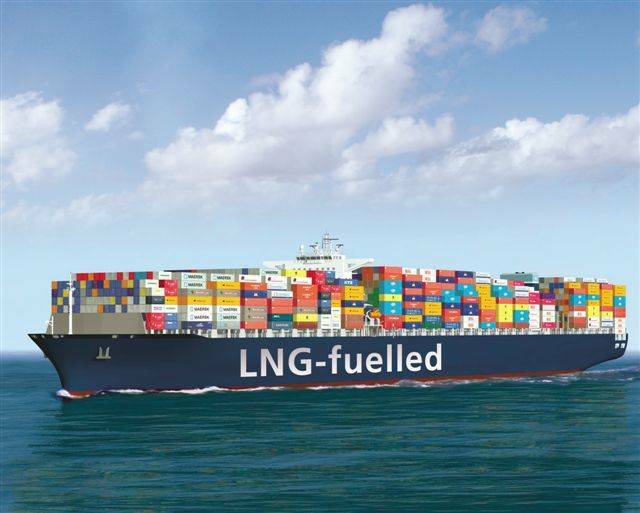 The use of liquid natural gas (LNG) as a marine fuel is increasing as new environmental regulations are enacted and bunkering facilities are expanded. Some forecast predict that around 10,000 vessels could be adopting LNG propulsion by 2020 compared to less than 100 today and classification society Det Norske Veritas had predicted that LNG would become the dominant fuel source for all merchant ships within 40 years. The main reason for this expected growth is because of strict emission regulations requiring the reduction of sulfur oxides (SOx) and nitrogen oxides (NOx) to 0.1 percent in Emission Control Areas (ECAs) by 2015 and 0.5 percent globally by 2020. 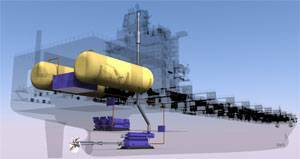 The key compliance options available for vessel operators are either adoption of new types of fuel, such as LNG or low sulphur marine gasoil, or by using “scrubber” technology on existing heavy fuel oil (HFO) burning powerplants. LNG is becoming cheaper as new sources are opened up through fracking, and increased discoveries of offshore and onshore gas reserves in Australia, Brazil, WA, Russia and the GoM. On top of this, the use of LNG as a maritime fuel has the potential to cut carbon emissions by about 25 %, SOx by almost 100 % and NOx by 85 %. At the same time, other technologies are also being developed, which include the use of liquid hydrogen as a fuel to generate power within a combined fuel cell and battery system as well as solar panel and automated sail systems. Meanwhile, maritime engine manufacturers are also investing in extremely efficient low-speed two-stroke diesel engines, designed for slow steaming, which is a trend that has been taken up by major ship operators around the world in order to decrease emissions and hopefully also reduce operational costs. LNG use in the maritime industry has been mainly restricted to smaller vessels operating short runs due to the large size of fuel tanks required and the few bunkering facilities available today and most of the development in maritime LNG propulsion has been undertaken in northern Europe where some LNG bunkering capability was established and is being expanded for the offshore oil industry and the large local ferry market. The expectation is that the use of maritime LNG propulsion will expand rapidly in emission control areas in the next decade as governments and the IMO become more stringent on emissions from larger transport vessels such as cargo ships, tankers and cruise ships. 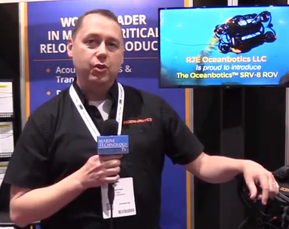 There already is a noticeable increase in LNG powered or Hybrid engines for port tugs and OSVs. 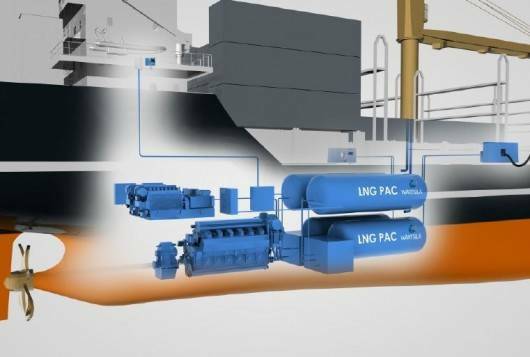 LNG onboard storage, along with regional and worldwide bunkering locations for refueling some of the challenges posed by this change to LNG and the increase in options here will be determining to the amount of growth in the use of Maritime LNG propulsion.